Welcome to the website of Static Solutions Limited. This legal document covers the content and acceptable usage of Static Solutions Limited. By accessing this site you are acknowledging your agreement to these terms and conditions. You may only access our site for legal purposes. You may not use it to post, submit or transmit any material that is; threatening, discriminatory, obscene, offensive, in breach of confidence or privacy, technically harmful, fraudulent or interferes with the normal operation of the site. By using our site you are agreeing to our legal usage terms. If you do not agree to these terms, please do not access our website. The use of any information or materials on this website is entirely at your own risk, for which we shall not be liable. It is your responsibility to ensure that any information, products or services that your purchase through this website meet your specific requirements. All materials displayed or made available on our website, including, but not limited to, trademarks and logos, graphics, documents, texts and images are owned or licensed to Static Solutions Limited or our suppliers, and are protected by copyright laws. By using our site you agree that you will only access the content for your personal and non-commercial use. No materials on this website may be reproduced, copied or transmitted without our permission. Our website may contain third party links to other sites. Once you use these links to leave our site, we do not have any control or responsibility for the content, or the privacy of the information you provide when visiting such sites. We may change, update, and terminate any of the content on our website. We have the right to makes these changes without notice. We may also stop your access to any part or all of the services provided by us on the site at any time, with or without cause or notice, and for any reason. We do not provide any warranty or guarantee as to the accuracy, timeliness, performance, completeness, suitability, pricing and availability of the information or products found on this website. You acknowledge that such information and materials may contain inaccuracies or errors and we expressly exclude liability for any such inaccuracies or errors to the fullest extent permitted by law. Unauthorised use of this website may give rise to a claim for damages and/or be a criminal offence. Your use of this website and any dispute arising out of such use of the website is subject to the laws of England, Scotland and Wales. We may update our website terms and conditions from time to time. Please refer back to this page for any changes. You may direct any queries about our Terms & Conditions to info@static-solutions.com or 01226 280798, you may also mail your query to us at Static Solutions Limited, Unit 7, Spring Park, Clayburn Road, Barnsley, South Yorkshire, United Kingdom, S72 7FD. © 2019. All Rights reserved. Static Solutions. 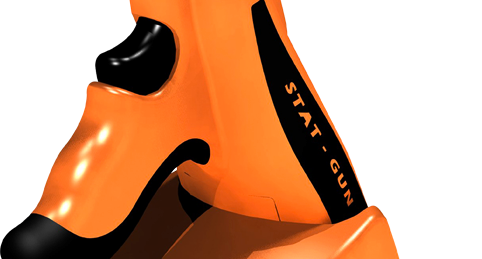 Stat-Gun® is a registered trademark of Static Solutions.